Looking like the proverbial dog that just stuck its mouth in a porcupine, the Ancistrus or Bristle-nose Catfish are a very interesting and colorful member of the Loricariidae family of catfish! The Bristlenose Catfish Ancistrus cirrhosus are amazing little tank cleaners and the masters of disguise. Sometimes they will sit motionlessly for hours almost to the point of not looking alive. They blend in amazingly well with their natural environment often making them difficult to see. Their appearance is almost alien with the bristles on the snout, but at the same time this bizarre appearance makes them desirable to many. 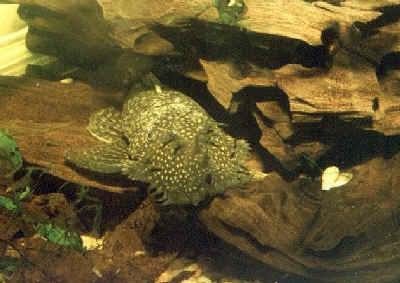 They are known by several other common names including Bristlenose Pleco, Bushynose Catfish, Jumbie teta. Not only are they an interesting sight to behold, but this catfish can also be used successfully to help rid the aquarium of problem algae. As herbivores, they eat algae from all surfaces in the aquarium by rasping it with their mouth. Keeping some wood in the tank, like bogwood, mopani, or driftwood, not only mimics their natural habitat but also provides a perfect place for this catfish to feed. Wood decorations are a great way of maintaining a constant natural food source for the fish. The Ancistrus is the largest group within the tribe Ancistrini and it currently has 64 recognized species. This fish, as well as its close cousin the Temminck's Bristlenose A. temminckii are the two most commonly seen in the hobby. However others like the Bushymouth Catfish A. dolichopterus, Snowflake Bristlenose or Pearl Sucker A. hopolgenys and the Medusa Pleco A. ranunclus are becoming more available. They are much smaller than their cousin the Pleco or Plecostomus Hypostomus plecostomus which has been the mainstay of algae eating aquarium fish for decades. Because they are smaller, the Bristlenose are better suited to smaller aquariums. Recently, these types of catfish have become more popular especially since they are easy to breed. This catfish reaches only about 3 1/2 inches (8.9 cm) in length, so can be kept in an aquarium of 10 gallons or more. Coming from fast flowing tributaries of the Amazon river, Ancistrus species prefer well oxygenated water with slow to moderate water flow. Occasionally this fish will dart to the surface to swallow air. If they do this frequently however, it is an indication that there is not enough oxygen or the presence of ammonia/nitrite in the water. The Ancistrus Catfish prefer a darker aquarium with pieces of wood or roots to form caves and hiding places. It also helps provide some natural algae growth for these fish to feed upon. They are nocturnal and so prefer feeding at night. Add some Moonlight LEDs for best night viewing. The Bristlenose Catfish Ancistrus cirrhosus (previously Hypostomus cirrhosus) was first described by Valenciennes in 1836. They are found in tributaries of the Amazon River in South America, specifically the Paraná River basin. Other common names they are known by include Bristlenose Pleco, Bushynose Catfish, Jumbie teta, Bristle-nose Catfish, Bristle Nose Pleco, Bristle Nosed Pleco, Bristle Nose Plecostomus, and Bushy Nose Catfish. The Ancistrus is the largest genus within the tribe Ancistrini and it currently has 64 recognized species. Other common names shared with all the species of this genus are Armor-Plated Catfish, Armor Catfish, Ancistrus Catfish, and Sucker-mouth Catfish. This species is not listed on the IUCN Red List of Endangered Species. With this and any other catfish take great caution not to allow them to escape in to the wild in other than their native habitat. Though they are small and seemingly harmless they can severely disrupt foreign ecosystems. The environment they inhabit ranges from fast flowing waters with a gravel substrate to very turbid standing waters with clay on the bottom. During the wet season they can be found in flooded forests. Their natural diet consists of algae and aufwuchs (microscopic food). When they are not feeding these fish normally hide and do not school as some catfish do. The adults enjoy deeper darker areas and the young are usually found in shallow bright areas. The Bristlenose Catfish can be identified by the bony plates on their body and a ventral, or underslung sucker mouth. Sometimes confused with their close relative the pleco, the Bristle-nose is much shorter, flatter, and fatter with a wider head. The males possess fleshy tentacles on their heads while the females only have smaller tentacles along their snout. These tentacles are unique to the genus Ancistrus. These little fish also have small spikes on their fins and a modified stomach that allows them to survive in conditions with low oxygen levels. They have an average lifespan of about 5 years, but can live longer with good care. The body is normally an uneven brown, black, olive, or gray in color with white or yellow spots depending on the region they are from. There is a 'piebald' variety that has large splotches of lighter color on the body. The abdomen is flat and lighter colored than the upper body. There is also an albino color morph, a mostly white colored fish, that is also available on occasion. Size of fish - inches: 3.5 inches (8.89 cm) - Males may be slightly larger. Lifespan: 5 years - The average lifespan is about 5 years, but they can live longer with proper care. This is a hardy fish that can tolerant to a wide range of water conditions. It is not a difficult fish to care for and can be recommended for beginner fish keepers. Juveniles are more sensitive to pH levels than adults, so adult fish are a better choice for beginners. They require clean water that is high in oxygen and a good supply of food on the bottom of the tank. These fish do a great job keeping the bottom cleaned of food and debris, making them little living tank cleaners. These fish are known to die from overeating so take care not to over feed. At the same time, it can sometimes be difficult to make sure this fish is getting the proper nutrients so make sure to vary their diet. If the tank is not established make sure to add algae wafers to the tank for food. Also, various vegetables can be anchored to the bottom of the aquarium to insure enough food. Since they are herbivorous the Bristlenose Catfish as well as Ancistrus genus in general will eat all kinds of algae. In the aquarium feed them a tablet food specifically formulated for bottom dwelling herbiviores. They will not harm plants, but make sure the aquarium is well seasoned and feed a supplemental sinking algae pellet, like spirulina tablets, to make sure they don't starve. Also blanched spinach, carrots, lettuce, zucchini, cucumbers, even peas can be use to supplement their diet. Because they are super algae eaters, they must have their veggies. You can be creative with the vegetables to find what they like best. Generally feed once or twice a day. Tablet / Pellet: Yes - This fish should be fed a tablet food formulated for bottom dwelling herbiviores. Vegetable Food: Most of Diet - Cut up zucchini, cucumbers, or peas can be anchored to the bottom. Meaty Food: Some of Diet - Only small amounts of meaty foods should be offered. About 10 - 15% will provide a good balance to their diet. These are hardy fish provided the tank is maintained. Aquariums are closed systems and regardless on size all need some maintenance. Over time decomposing organic matter, nitrates, and phosphate build up and the water hardness increases due to evaporation. Water changes are important to keep this fish happy, about 25% of the tank water should be replaced every other week. Take care when doing water changes as these fish do have rigid cheek spines (odontodes) which they will stiffen when they become anxious or aggressive. Also take care when netting as both the cheek spines and the 'hooked' tentacles on their heads and mouths can become entangled. Water Changes: Bi-weekly - Water changes of 25% every other week are recommended. The Bristlenose Catfish will spend most of its time on the bottom of the tank, though will sometimes be seen clinging to the glass on the side. With their fairly small size they can be kept in an aquarium of 10 gallons or more. They prefer well oxygenated water with a slow to moderate water flow. An undergravel filter system will work well to maintain clean water and ensure the entire tank is highly oxygenated. Occasionally this fish will dart to the surface to swallow air. If they do this frequently however, it is an indication that there is not enough oxygen or the presence of ammonia/nitrite in the water. The use of a powerhead or airstones can also aid in keeping the tank aerated. For the tank setup it is good to use a smooth substrate, and as they are nocturnal fish, there needs to be many hiding places for them to go during the day. Plants along with rocks, large twisted roots, and driftwood can create nooks and caves which make great hiding places. These will also help shelter their fry if you keep a breeding pair. Wood decorations such as driftwood are very beneficial to these fish. They not only help with hiding places but will also provide places for algae to grow for these fish to feed upon. To get the most out of this fish use Moonlight LEDs to observe them at night. Very cool! Water Movement: Moderate - Moderate to strong water movement to simulate slow moving rivers. Water Region: Bottom - These fish will stay in the bottom of the aquarium, and sometimes on the sides clinging to the glass. These catfish generally get along well with other fish but may fight among themselves, especially if two males are put in a small aquarium. Some Ancistrus males have even been observed with their bristles tangled together from their rambunctious behavior! These fish are harmless to free swimming fish and fry of any size, but will eat fry and eggs that are not free swimming. These fish can usually be kept with more aggressive fish as well. Their bony exoskeleton and sharp spines are great protection from other fish. Temperament: Peaceful - This fish is generally peaceful however intraspecies aggression is not uncommon, particularly among males. Same species - conspecifics: Yes - Two males put together may fight, especially in a smaller aquarium. Semi-Aggressive (): Monitor - Can usually be kept with semi-aggressive and even aggressive fish such as cichlids. Most males of the ancistrus species have more and longer tentacles than the females, this is especially true of the A. hoplygenys. On the A. cirrhosis the male has an antler-like bump on its forehead while the female has a row of short tentacles. The A. hoplygenys male is larger with barbs, while the female is smaller but without barbs. The Bristlenose Catfish is relatively easy to breed. But the breeding of this species does occur mostly in the winter months. This is the Amazon's rainy season when there is an influx of cooler water. They can breed in their normal tank or you can set up a breeding tank in the same manner as their normal habitat. To trigger the breeding behavior, in the late fall perform a 75% water change with cool water, simulating the influx of colder water the rainy season brings in nature. One aquarist reportedly bred this catfish in water as cold as 64.4° F (18° C), though he said they didn't really like water that cold. A breeding tank can be 10 to 20 gallons or more with plenty of caves and driftwood. A mature male needs to have plenty of room to claim a territory that is most suitable for spawning. The recommended water conditions are slightly acidic with a 6.5 - 7.0 pH and 5 - 10° dGH. The male usually cleans his chosen spawn site and then will draw the female over to inspect the area. Courtship display involves the male extending his dorsal and caudal fins. He will attempt to entice the female to his nest and then keep in close contact. The female can lay between 20 - 200 adhesive eggs. The eggs will usually be deposited in clusters in the hollows of a piece of driftwood or roots. Once the eggs are laid, the female takes no part in caring for either the eggs or the young. The male however, is very devoted, and will guard the nest for about the next 7 to 10 days. He will clean the nest and the eggs, remove any bad eggs, and aerate the eggs by fanning them with his fins. He usually won't even leave the nest to feed, or if he does it's a very quick trip. The eggs will hatch in 4 - 10 days, at which time the young will attach themselves to flat surfaces like the sides of the aquarium until their yolk sacs are absorbed, taking about 2 - 4 more days. After that the free swimming will begin to feed on algae if available. At this time you can feed them pulverized green flake food, mashed and peeled peas, or other baby food. Bristlenose Catfish are extremely hardy and disease is not usually a problem in a well maintained aquarium. That being said there is no guarantee that you won't have to deal with health problems or disease. The section on fish diseases is a good source for information on symptoms and treatments. It is recommended to read up on the common tank diseases. Knowing the signs and catching and treating them early makes a huge difference. Bristlenose catfish are very resilient. High nitrate levels can cause Bristlenose catfish to develop infected barbels; this makes it difficult for them to navigate and eat normally. Maintain nitrate levels below 20 ppm with water changes. A good thing about Bristlenose is that due to their resilience, an outbreak of disease can often be limited to just one or a few fishes if you deal with it at an early stage. When keeping more sensitive types of fish, it is common for all fishes to be infected even before the first warning signs can be noticed. The best way to proactively prevent disease is to give your Bristlenose Catfish the proper environment and give them a well balanced diet. The closer to their natural habitat the less stress the fish will have, making them healthier and happy. A stressed fish will is more likely to acquire disease. Remember anything you add to your tank can bring disease to your tank. Not only other fish but plants, substrate, and decorations can harbor bacteria. Take great care and make sure to properly clean or quaranteen anything that you add to an established tank to keep from introducing pathogens. Because they are a scaleless fish, catfish can be treated with pimafix or melafix but should not be treated with potassium permanganate or copper based medications. Malachite green or formalin can be used at one half to one fourth the recommended dosage. All medications should be used with caution. The Bristlenose Catfish is usually readily available in both pet stores and online. The Ancistrus species in general are widely available but finding a particular species can be difficult. More exotic varieties are available but can be expensive. Hope you still have your bristle nose catfish. Most literature would indicate that they are underfed if they are demolishing your sword leaf plants. This is the 2nd batch of baby bushynose plecos we have had. The first batch did not go well and all the babies died because I moved them into a 10gallon tank that was not cycled yet. The father pleco also ended up dying. I had another tank with another male and moved him to to female tanks so now there are move babies. The babies because free swimming on Monday but the dad outdated let them out of the cave. Today a few have snuck out but the rest are still in the cave with dad. I tried feeding a sinking pellet and a small piece of blanched zucchini but no one touched it and I had to remove the food from the tank. I am worried that they will die either because dad won't let them out of the cave or that they are not smart enough to find the food. I have had to do water changes daily since the nitrate went up to 10. I would say I changed about 1/3 of the water. Do I have to forcefully remove dad? (Which knowing him I will have to take the rock he is in out of the water and make him drop into the tank, but there are babies in their too! . ) how do I get them to eat without polluting this small tank?